Today is Nusantara Day in Indonesia. It is not an official holiday but it is an important anniversary because on this date in 1957 the official boundary of the Indonesian archipelago was declared in the Deklarasi Djoeanda which eventually led to the recognition of the principles of the Nusantara in the United Nations Convention on the Law of the Sea in 1982. The point is that in no sense is the nation of Indonesia a unitary state except politically. Geographically, culturally, and linguistically it is a highly diverse and hard to define entity. The concept of Nusantara is an important binding element for Indonesia in the modern age, with long roots. In my experience, foreigners (especially non-Asians) have only the vaguest idea of what (or where) Indonesia is as a nation. They just know that it is “over there” somewhere, and would be hard put to name the constituent islands or talk intelligently about its history. 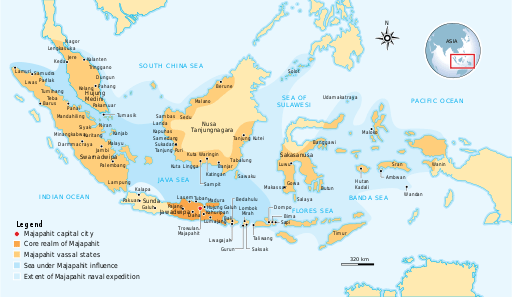 Nusantara is a preferred contemporary Indonesian term for the Indonesian archipelago. It originated in Old Javanese (strictly speaking in Kawi) and literally means “outer islands.” It comes from the terminology of the Majapahit Empire which peaked in the 14th century, centered on the island of Java. The original meaning of Nusantara was rather different from the modern meaning, however; the term was appropriated and redefined in the 20th century. The word Nusantara was taken from an oath by Gajah Mada in 1336, as recorded in the Pararaton (Book of Kings) and Nagarakretagama. Gajah Mada was a powerful military leader and prime minister of Majapahit who was credited with bringing the empire to its peak of glory. Gajah Mada delivered an oath called Sumpah Palapa, in which he vowed not to eat any food containing spices until he had conquered all of Nusantara under the glory of Majapahit. Today, Indonesian historians believe that though the word Nusantara was coined by Gajah Mada for the first time in 1336, the idea is older. In 1275, Kertanegara of Singhasari used the term Cakravala Mandala Dvipantara for roughly the same region. Dvipantara is a Sanskrit word for the “islands in between,” the slight synonymy with Nusantara lies in that both dvipa and nusa mean “island.” Kertanegara envisioned the union of Southeast Asian maritime kingdoms under Singhasari as a bulwark against the rise of the expansionist Mongol Yuan dynasty in mainland China. 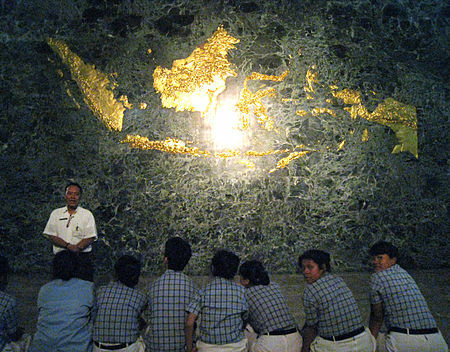 Negara Agung, or the Grand State, the core kingdom. The traditional or initial area of Majapahit on Java during its formation before entering the imperial phase. This included the capital city and the surrounding areas where the king effectively exercised his government. Mancanegara, areas surrounding Negara Agung — traditionally refer to Majapahit provinces in East and Central Java. This area covered the eastern half of Java, with all its provinces ruled by the Bhres (dukes), the king’s close relatives. These areas were directly influenced by Javanese Majapahit court culture, and obliged to pay annual tributes. Nusantara, areas which did not reflect Javanese culture, but were included as colonies and had to pay annual tribute. They enjoyed substantial autonomy and internal freedom, and Majapahit did not necessarily station their officials or military officers here. However, any challenges to Majapahit oversight might draw severe response. These areas included the vassal kingdoms and colonies in Malay peninsula, Borneo, Lesser Sunda Islands, Sulawesi and Maluku. The name disappeared subsequently until the 20th century. In 1920, Ernest Francois Eugene Douwes Dekker (1879–1950), who was also known as Setiabudi, introduced a new name for a proposed independent country that would be the successor state of colonial Dutch East Indies — which unlike the name “Indonesia” — did not contain any words etymologically inherited from the name of India or the Indies. His new proposed name was Nusantara. This is the first instance of the term Nusantara appearing after it had been written used in the Pararaton manuscript. The definition of Nusantara introduced by Setiabudi was different from the 14th century definition of the term. During the Majapahit era, Nusantara described vassal areas to be conquered. Setiabudi didn’t want this aggressive connotation, so he re-defined Nusantara as all the Indonesian regions from Sabang as far as Merauke. These days, in Indonesian, Nusantara is synonymous with Indonesian archipelago or the national territory of Indonesia, and in this sense the term Nusantara excludes Malaysia, Singapore, Brunei and the Philippines. Finding a dish suitable for all of Indonesia is difficult given that the nation-state covers a multitude of different cultures and languages. Nonetheless I think nasi goreng fits the bill – sort of. Nasi goreng translates literally as “fried rice” but it is distinguished from other Asian fried rice recipes by its aromatic, earthy and smoky flavor, owing to generous amounts of caramelized sweet soy sauce (kecap manis) (sweet soy sauce) and ground powdered shrimp paste (terasi), and the taste is stronger and spicier than Chinese fried rice. That said, nasi goreng is hardly a uniform dish throughout Indonesia even though it is often spoken of as the national dish. In most parts of Indonesia, nasi goreng is cooked with ample amounts of kecap manis (sweet soy sauce) that creates a golden brownish color and the flavor is mildly sweet. However, in other places such as Eastern Indonesia (Sulawesi and Maluku), the sweet soy sauce is replaced by bottled tomato and hot chile sauce, creating reddish-colored nasi goreng. 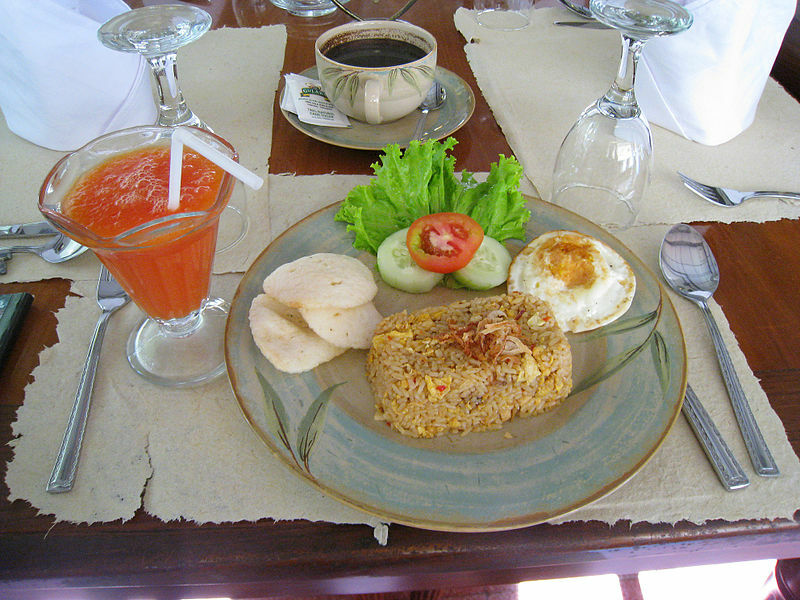 This variant is called nasi goreng merah (red fried rice) or nasi goreng Makassar after the South Sulawesi capital. Some variants of nasi goreng, such as salted fish or teri Medan (Medan’s anchovy) nasi goreng, do not use sauces at all creating a lighter color similar to Chinese fried rice or Japanese chahan. The most common nasi goreng usually incorporates chicken and egg, however, some variants are named after their additional ingredients, such as nasi goreng kambing (with goat meat), nasi goreng pete/petai (with green stinky bean), nasi goreng jamur (with mushroom), nasi goreng sapi (with beef), nasi goreng udang (with shrimp), nasi goreng seafood (with seafood, such as squid, fish and shrimp), nasi goreng ikan asin (with salted fish), nasi goreng teri medan (with Medan’s anchovy), etc. 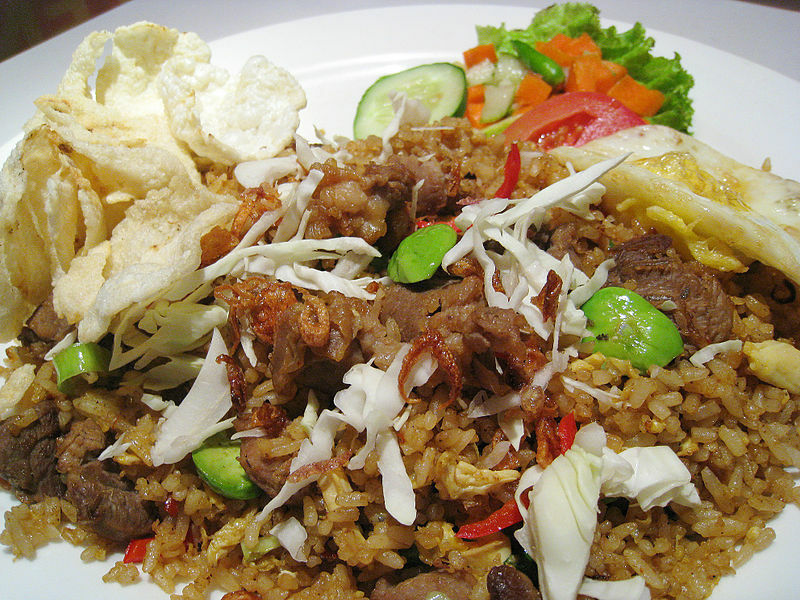 Other specific nasi goreng recipes include nasi goreng kampung and nasi goreng Jawa (Javanese fried rice). While nasi goreng amplop is fried rice “enveloped” inside thin omelette skin, almost identical to Malaysian nasi goreng pattaya.